If you’re a parent who has ever had to go through potty training your child, you know how challenging it can be. Here are some tips to help make the process a little easier and maybe even effortless! First of all, you’ll want to determine which type of training seat you want to use. There are many different options on the market made specifically for boys or girls. You’ll also want to determine how portable you need your seat to be. If your child is the only one using the toilet, you might consider a semi-permanent training seat like the Bemis NextStep Potty Seat. The Bemis seat comes with design features that allow the seat to be easily removed for cleaning, or to remove the smaller seat when it’s no longer needed. It’s a two-in-one toilet seat and it accommodates adult and child users equally. When not in use, the potty seat automatically secures by magnet into the molded seat cover, meaning adults won’t have to manually lift the child seat. When it’s time for little ones to use it, toddlers can easily pull it down by themselves. This will help with their independence and reinforce their “I can do it myself” sense of confidence. If you’re a parent who wants to keep your bathroom clean and clutter-free, this is the toilet seat for your family. No matter which seat you choose for your child, just remember to be patient. Potty training can take time, however with the right tools, you’ll be set up for success. As seen on Hood Magazine. Many think a garbage disposal works like a blender, with spinning blades chopping and breaking down the waste. In reality, there are NO blades involved. Instead, impellers (or lugs) mounted on a spinning plate continuously force food waste particles against a stationary grind ring. The grind ring breaks down the food waste into very fine particles – virtually liquefying them. After they are ground, the running water flushes the particles through the grind ring and out of the disposer and into your wastewater pipe. Run your disposal along with a moderate flow of cold water. Continue to run cold water for a few seconds after grinding is complete. Avoid using hot water when grinding food waste because hot water will melt grease particles and then as the water travels down the pipes in your home it will cool and cause a blockage far from the sink. It is OK to drain hot water into the disposer between grinding periods. Use a disposal cleaner to relieve odors caused by build-up, or grind citrus fruit peels to freshen up the drain area. Disposals may also be cleaned with Disposer Care®. This product is available in major home centers, hardware and grocery stores. Food waste disposals can be an environmentally responsible alternative to transporting food waste to landfills and they can help reduce greenhouse gas emissions. At capable waste-water treatment plants, food waste can be recycled to produce methane that can be used as a renewable source of power for the plant. 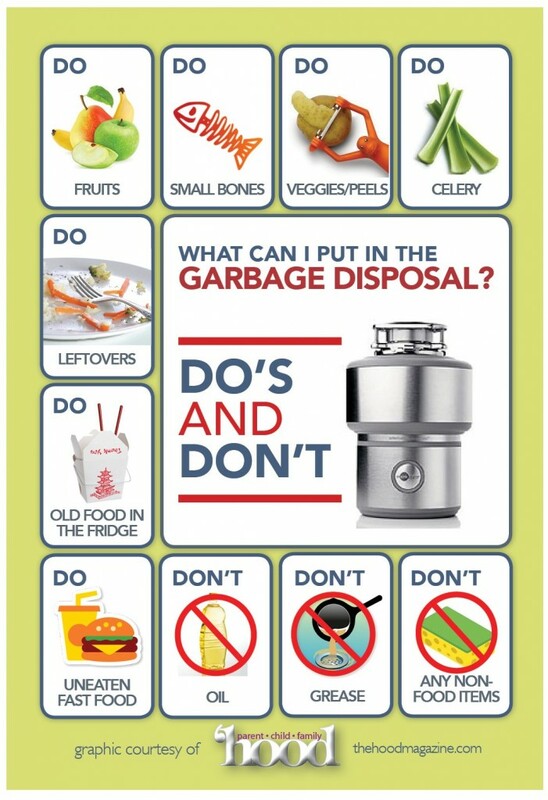 It’s also important to check what brand of disposal you have and do your research to understand what capacity your disposal can handle. Some disposals are not built to handle fibrous materials such as celery and corn husks. Some disposals are also not equipped to handle hard materials like bones and fruit pits.